It's been a very long day and I really should have gone to bed hours ago but, as you can see, I'm up at nearly 1 a.m. making cards. Life is good! One of the requirements for the Retro Rubber Challenge is that at least one of the stamp sets you use on your project must be at least a year old or older. The sentiment I used for my card is from the 2015 Sheltering Tree stamp set. 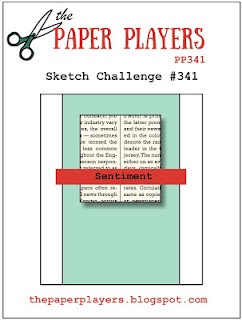 And, I loved the sketch from The Paper Players. Very clean and uncluttered. I really like the way this came together. The button embellishment is from the Retro Rubber Challenge had an embellishment challenge. For all the challenge details and to share your project, click the image below. Oh, I love this! I like the stylish paper you've used in the background - neutral, yet interesting. I like the die cut leaves and the unusual green flower but the sweet oversize bow is the clincher for me. 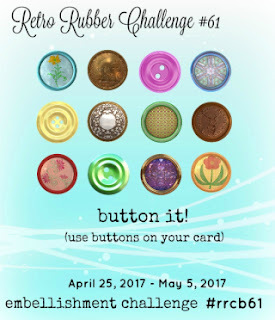 Thanks so much for joining us at Retro Rubber on our button challenge. Thanks, Jan! I don't use patterned paper very often but I do like it. The button was in my stash. I used to save buttons so have so many of them from which to choose. Marsha, this is so pretty! Love the pretty flowers and leaves so much!! I looked up the Sheltering Tree stamp set that you used and it actually came out in 2015 Occasions Catalog and is still available. SU did have a stamp set by the same name back in 2006 but it is much different. Thank you for playing along with us at Retro Rubber. I always love seeing you in our gallery and hope you will join us again soon. Such a lovely card, simple elegance! Thank you so much for joining the RRCB! Beautiful card! Love the flower with the button. Thanks for joining Retro Rubber. This card did come together beautifully! The button center is a great finishing touch along with the twine. Thank you for playing along with Retro Rubber! Marsha, I have to agree with your comment of clean and uncluttered... a beautiful combination of the two challenges. Thanks so much for playing along with Retro Rubber this week. Love it when you are in our gallery!! Thank you, Katy! RRCB is one of my all time favorite challenges. I try not to miss but sometimes life gets in the way.